Boston Stone Works - Natural and Engineered Stone Counter Top Supplier. Read our news. February 3, 2016 – Boston Stone Works, LLC of Quincy, Massachusetts has won “Best Of Customer Service” on Houzz®, the leading platform for home remodeling and design. The premier provider of custom stone countertops was chosen by the more than 35 million monthly unique users that comprise the Houzz community from among more than one million active home building, remodeling and design industry professionals. "The Boston Stone Works team is thrilled to be the recipient of "Best Of Houzz 2016" award for Customer Service. Our goal is to exceed each client’s expectations in terms of design, fabrication and installation of their custom countertops, and communication throughout the process. Recognition by the Houzz community for our level of service is an honor and a testament to our level of commitment," said Boston Stone Works founder Mona Sharaf. "Anyone building, remodeling or decorating looks to Houzz for the most talented and serviceoriented professionals" said Liza Hausman, vice president of Industry Marketing for Houzz. " We’re so pleased to recognize Boston Stone Works, voted one of our "Best Of Houzz" professionals by our enormous community of homeowners and design enthusiasts actively remodeling and decorating their homes." Follow Boston Stone Works on Houzz. Boston Stone Works, LLC has earned the home service industry's coveted Angie's List Super Service Award, reflecting an exemplary year of customer service to members of the local services marketplace and consumer review site in 2016. "Companies that can meet higher demands without missing a beat in their exemplary performance standards truly do stand apart from their peers," said Angie's List Founder Angie Hicks. "Only a fraction of the Stone Countertop companies in Greater Boston area were able to do it." 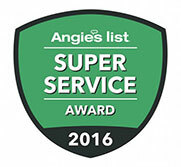 Angie's List Super Service Award 2016 winners have met strict eligibility requirements, which include an "A" rating in overall grade, recent grade, and review period grade. The SSA winners must also be in good standing with Angie's List, pass a background check and abide by Angie's List operational guidelines. For more than 21 years, Angie's List restricted access to its verified reviews to consumers who paid membership fees. When the company removed that barrier, some companies worried that the new, non-paying members would not be as engaged as members of the past. Experience has shown, however, that these newly added members are just as engaged – across all age groups – as prior members. Also, because the company continues to adhere to its review verification process, there has been no degradation of review quality. "The biggest change at Angie's List is that we are connecting even more consumers to high quality service professionals," Hicks said. "And that's good for everyone." Follow Boston Stone Works on Angie's List.